We report a rare case of a 5-year-old child with tuberculous chronic suppurative otitis media with postaural fistula. The review of available literature reports on the primary tuberculosis of the temporal bone has shown that the primary tuberculosis of the temporal bone is an extremely rare occurrence, but there is a need for swift recognition of this elusive diagnosis and prompt management. The case report highlights how diligent one must be in order to get the diagnosis. The incidence of tuberculosis in the middle ear is very low; accounts for only 0.04% of all cases of chronic suppurative otitis media (CSOM). When it does occur, it is associated with substantial morbidity, and a delay in initiating therapy can lead to serious complications. These complications include early destruction of the middle ear conductive mechanism, facial paralysis, cochlear involvement with labyrinthitis and sensorineural hearing loss, and intracranial dissemination of infection. In this case report, we describe a 5-year-old child with tuberculous otitis media and attempt to increase awareness of this disease in the medical fraternity and emphasize the need for prompt recognition and treatment. A 5-year-old male child was brought to our hospital on 28/01/09 with a complaint of non-healing left-sided postaural fistula since 1 year and left facial nerve paresis since 1 month. The patient was apparently well 1 year ago when he developed left ear discharge followed by left postaural swelling a week later. At a hospital in Jamnagar, he was found to have polyp in the left ear in addition to the postaural swelling. Incision and drainage of the postaural swelling was performed twice and modified radical mastoidectomy was done. The wound did not heal despite administering antibiotic therapy aggressively for 2 months, and a large defect developed in the left postaural area. Then, he was brought to our hospital [Figure 1]. On admission, the patient had a 2 × 2 × 2 cm 3 fistula in the left postaural region, covered by polypoidal granulation. The left external auditory canal (EAC) was full of pus, and a 1 × 1 × 1 cm 3 swelling was also present in the left auricular area. Rest of the ear, nose, and throat examination was normal [Figure 2]. Routine work-up was done, of which the erythrocyte sedimentation rate (34 mm) and the positive Mantoux test were noteworthy. Chest X-ray was normal, and three sputum smears were negative for acid fast bacilli. A pure tone audiogram showed moderate mixed hearing loss in the left ear and normal hearing in the right ear [Figure 3]. A computed tomographic (CT) scan of the temporal bones with brain cuts was done, which showed multiple hypodense lesions with enhancing wall in the left occipital region and in the postauricular and parotid region, which suggested multiple abscesses; bilateral CSOM with nonvisualization of ossicles on the left side; soft tissue opacity in left EAC and left middle ear, with erosion of petrous apex; erosion, and sclerosis in the left mastoid region with postoperative bony changes; left semicircular canals and cochlea well visualized; and facial canal eroded on the left side and nerve intact on both sides. Ultrasonography of abdomen showed multiple enlarged mesenteric lymph nodes in the right inguinal fossa, approximately 1 × 1 cm 2 each. Culture and sensitivity of the pus from the left ear showed heavy growth of Pseudomonas aeruginosa, and appropriate intravenous antibiotics were started. Re-exploration of the left ear was done, and pale granulations were removed from the fistula and middle ear. The dural and sinus plates were absent. Tissue removed from fistula was sent for histopathological examination reported to be suggestive of tubercular granuloma. A pediatric opinion was taken, and after corroborating the findings, AKT (2HRZE + 7HR, cat III) and steroids were started on 11/02/09. The patient showed a dramatic response with shrinkage of the postaural wound with healthy granulation and improvement of facial paralysis over a period of 1 month. On 7/03/09, an occipital rotation flap for the residual defect was done by our plastic surgery department [Figure 4]. The pathogenesis of tuberculous otitis media may involve following three major mechanisms: (1) aspiration of mucus through the Eustachian tube More Details, (2) blood-borne dissemination from other tuberculous foci, or (3) in rare cases, direct implantation through the EAC and a tympanic membrane perforation. Examination of the affected ear will usually reveal pale-yellow granulation tissue on a thickened and hyperemic tympanic membrane. Perforations usually occur in the area of the granulation early in the disease as a result of the coalescence of the granulomas. The consistency of the discharge ranges from thick and mucoid to thin and watery. The granulomatous process often produces a visible destruction of the ossicles, which can be seen through the tympanic membrane perforation. As the disease progresses, the amount of granulation tissue can become profuse and lead to an atticoantral blockage. A direct extension of the mucosal disease can lead to mastoiditis or tuberculous osteomyelitis of the temporal bone. Associated facial nerve paralysis is seen in approximately 16% of adult cases and 35% of pediatric cases. 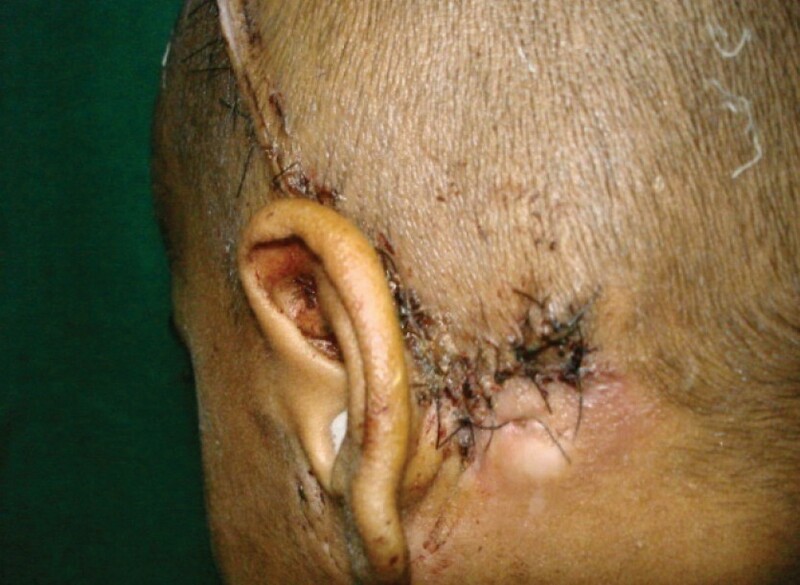 Another reported complication is a severe intracranial spread of the infection that results in extradural abscess formation or tuberculous meningitis; these latter manifestations can be the initial signs of tuberculous otitis media. Labyrinthitis and petrositis have also been reported in association with the mastoid disease. The differential diagnosis is broad and includes such disorders as histoplasmosis, North American blastomycosis, South American blastomycosis, syphilis, midline granuloma, Wegener's granulomatosis, histiocytosis X, nocardiosis, necrotizing external otitis, lymphoma, bacterial otitis media, and cholesteatoma. These diagnoses can be ruled out clinically by the presence of pain and the type and consistency of the discharge. After proper diagnosis, the initial management of tuberculous otitis media should be medical. Antituberculosis drugs dramatically improve the prognosis in most patients. For complete cure, drug therapy should be taken for at least 6 months. During serial follow-up examinations, the physician should look at otic discharge as the benchmark for defining the response to treatment. Surgical intervention should be added to drug therapy in cases of complications. However, tympanoplasty or mastoidectomy in the absence of appropriate drug therapy will likely be complicated by fistulae, nonhealing of suture lines, and tympanoplasty failure. When surgery is required, the techniques and guidelines are the same as those for the surgical treatment of chronic bacterial otitis media, with or without cholesteatoma. It is true that the primary tuberculosis of ear is exclusively a disease of children. This case highlights the value of microbiological and histopathological examination as important adjuncts to clinical diagnosis in order to avoid unnecessary surgery. Ear surgery in such cases without antitubercular treatment may complicated by fistulae, nonhealing of suture lines, and tympanoplasty failure. 1. Ash I E. Otolaryngology.In: Maloney WH, editor. Vol1.chapt. 4. London: Harper and Row;1968.p.33. 2. Lederer FL. Otolaryngology. In: Paparella,Shumrick.Vol2. Philadelphia: W.B.Saunders Company;1973. p. 161. 3. Weiner GM, O'Connell JE, Pahor AL. The role of surgery in tuberculousmastoiditis: Appropriate chemotherapy is not always enough. J Laryngol Otol 1977;111:752-3. 4. Windle-Taylor PC, Bailey CM. Tuberculous otitis media: A series of 22 patients. Laryngoscope 1980;90:1039-44. 5. Jeanes AL, Friedmann I. Tuberculosis of the middle ear. Tubercle 1960;41:109-16. 6. M'Cart HW. Tuberculous disease of the middle ear. J Laryngol Otol 1995;40:456-66. 7. Ramages LJ, Gertler R. Aural tuberculosis: A series of 25 patients. J Laryngol Otol 1985;99:1073-80. 8. Hoshino T, Miyashita H, Asai Y. Computed tomography of the temporal bone in tuberculous otitis media. J Laryngol Otol 1994;108:702-5. 9. alik MK, Pratap VK, Kumar A, Bhati S. Tuberculosis of middle ear. Indian J Tuberc 1992;39:243.